Since most of Inhabitat’s NYC-based writers live a car-free life, we’d be the first to tell you that the Big Apple is extremely walkable, and as it turns out, there is copious data to back-up that claim! The Walk Score has just released its annual report measuring the walkability of cities throughout the world and New York City topped the list for large U.S. cities, scoring 85.3 out of 100. Walk Score examines the distance between an address and a diverse set of amenities; the closer the distance, the higher the score. Can you guess which NYC neighborhood is the most walkable of them all? For a more detailed explanation, you can read the Walk Score Methodology paper. The image above is a heat-map created by Walk Source, with the most walkable neighborhoods pictured in green and the least walkable shown in red. You can see all of the rankings for NYC neighborhoods here. San Francisco came in at a close second, with a score of 84.9, and Boston, Chicago, and Philadelphia placed third, fourth, and fifth, respectively. You can see all the rankings here. How did your city or neighborhood fare? Let us know in the comments below! Since most of Inhabitat's NYC-based writers live a car-free life, we'd be the first to tell you that the Big Apple is extremely walkable, and as it turns out, there is copious data to back-up that claim! The Walk Score has just released its annual report measuring the walkability of cities throughout the world and New York City topped the list for large U.S. cities, scoring 85.3 out of 100. Walk Score examines the distance between an address and a diverse set of amenities; the closer the distance, the higher the score. 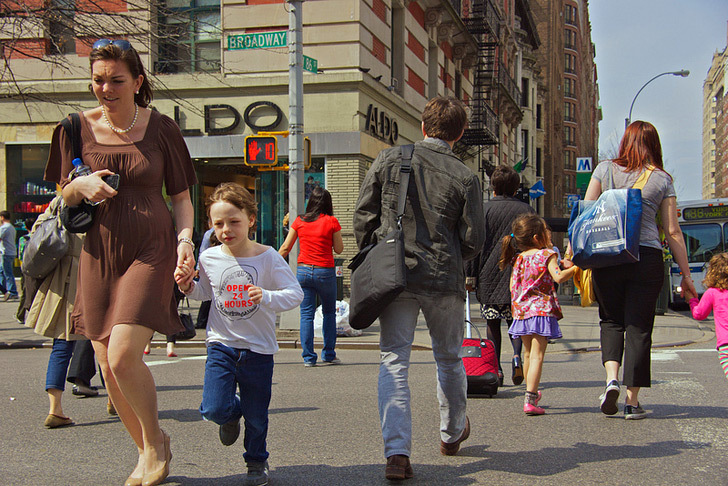 Can you guess which NYC neighborhood is the most walkable of them all?